The Holi season is upon us and we all know how colorful this festival can be. Come to think of it, colors play a very crucial part in our lives. They make everything look vibrant and alive. Let’s use this colorful opportunity to learn a few idioms and phrases related to colors and make our vocabulary MORE COLORFUL. • I don’t like her because she always gives off-color comments about people. • Sam was sailing under false colors – he never told her that he was already married. • I don’t know what would be his next step. He never nails his colors to the mast. • He handled the whole situation as if he feared no colors. • I thought that was her boyfriend but it turned out to be her brother—that’s a horse of a different color. • I knew from the beginning that you’ll pass the test and come out with flying colors. • When I got into trouble, my so called best friend left me alone and that showed me her true colors. • Amy is a free-spirited girl and she likes to color outside the lines. • Idioms and phrases always give color to any language. • I want to see the color of his money before I sell him the car. I hope this made your Holi more fun and colorful. Have a great time with all the colors around you. Read our blog ‘Commonly Mispronounced Modern Color Names‘ and add more colors to your vocabulary. 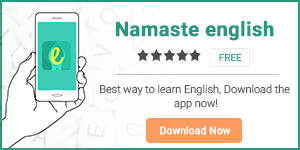 Learn more by downloading our English learning app Namaste English.